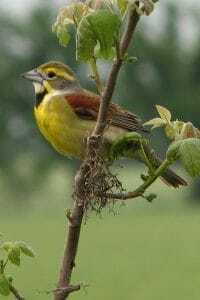 The Dickcissel invasion has extended to the Kawarthas! This afternoon around 4:50, Iain Rayner found a male Dickcissel just north of Fowlers Corners (NW of Peterborough) @ 1203 Frank Hill Rd (County of Kawartha Lakes). It was sitting on the hydro wire across from the laneway into house #1203. I went and had a look this evening and found it in the same spot. It was singing from variety spots…hydro lines, fence posts, shrubs…giving great views! Pics can be found in my ebird report. From Highway 115, go north on Hwy 7/28 approx 10km to Fowlers Corners. Continue north on Frank Hill Rd approx. 3km.